Background Evidence-based international guidelines on chronic obstructive pulmonary disease (COPD), and their corresponding recommendations, were established to improve individual COPD prognosis, and ultimately to improve survival. The aim of this study was to determine whether the long-term mortality after discharge from a COPD hospitalisation has improved recently, and the effect of co-morbidity treatment in improving COPD prognosis. Methods In a prospective cohort study design of two cohorts 7 years apart, patients discharged from the same university hospital after a COPD exacerbation were followed-up, and their outcomes compared. Demographic and clinical variables, as well as lung function, were collected with the same protocol by the same investigators. Comprehensive assessments of co-morbidities and treatments were undertaken. Kaplan–Meier survival curves were estimated, and outcomes were compared by means of Cox regression methods. Results Overall, 135 participants in the 1996–7 cohort and 181 participants in the 2003–4 cohort were studied. Both cohorts were comparable in their baseline demographic and clinical variables, and median follow-up was 439 days. The 3-year mortality was lower in the 2003–4 cohort (38.7%) than in the 1996–7 cohort (47.4%) (p=0.017), and the RR of death after adjustment for gender, age, body mass index, co-morbidities, lung function and mMRC (modified Medical Research Council scale) dyspnoea was 0.66 (95% CI 0.45 to 0.97). Long-term survival improved in the second cohort for patients with COPD with heart failure or cancer (p<0.001). Conclusions A recent trend towards better prognosis of patients with COPD after hospital discharge is described and is likely to be associated with better management and treatment of COPD and co-morbidities. Until recently only smoking cessation and long-term oxygen therapy in patients with hypoxia were considered as improving survival in patients with COPD. However, new evidence from trials and meta-analyses has emerged suggesting that several respiratory drugs may have an impact on mortality.6–10 It is not known whether these changes modify the overall prognosis after a COPD hospitalisation. COPD admissions usually occur in patients with severe disease, frequent co-morbidities and a poor prognosis.11 12 Clinical insight signalled that a better, holistic management of the patient with COPD and conditions associated with the illness might be related to better individual outcomes, although to the best of our knowledge to date there are no published studies exploring this hypothesis. The aim of this research was to determine whether the long-term mortality after discharge from a COPD hospitalisation has been reduced recently, and to learn about the effect of co-morbidity treatment in improving COPD prognosis. This is a prospective cohort study design, following-up patients discharged from hospital after a COPD exacerbation that required a hospitalisation. The two cohorts of patients were 7 years apart, 1996–2003. All patients were admitted to and discharged from the Hospital Mútua de Terrassa, a 450-bed university hospital in the city of Terrassa, close to Barcelona, Spain. Inclusion and exclusion criteria were the same for both cohorts. Briefly, all consecutive patients admitted for an acute exacerbation of COPD to any medical ward at our institution during the periods October 1996 to May 1997 and June 2003 to September 2004 were studied. Inclusion criteria were: (1) hospitalisation for suspected COPD exacerbation at admission and confirmed at discharge; and (2) forced spirometry showing postbronchodilator forced expiratory volume in 1 s (FEV1)/forced vital capacity (FVC) <0.7 and an FEV1 ≤70% of their reference value, compatible with COPD of at least moderate severity. The timing of forced spirometry was different for the two cohorts, this being the only protocol change between them. Spirometry was conducted on discharge in the 1996–7 cohort, while it was conducted 1 month after discharge in the 2003–4 cohort. To avoid any potential survival bias due to our protocol change in the timing of spirometry, those patients in the 2003–4 cohort who died between discharge and the scheduled outpatient follow-up visit 1 month later were still included, and lung function data within the previous 6 months were used. Exclusion criteria were a history of asthma, pneumonia or pulmonary oedema at admission, hospitalisation for causes other than a COPD exacerbation, bronchiectasias as predominant disease, death during hospitalisation or patient refusal to participate in the study. In all cases, the need for hospitalisation was decided upon by the doctors on duty in the Emergency room. The study protocol was approved by the Hospital Research and Ethics Committee, and all subjects gave their written informed consent. Lung function was assessed in the lung function laboratory by means of forced spirometry prebronchodilator test and postbronchodilator test, and reviewed by a chest physician. Spirometry was conducted according to the Spanish SEPAR guidelines, which mirror the American Thoracic Society (ATS)/European Respiratory Society (ERS) guidelines, and severity staging was assessed according to international guidelines.4 13 14 Measurement of arterial blood gases (partial pressure of oxygen and carbon dioxide; Pao2 and Paco2) at rest was made during room air breathing, and the body mass index (BMI) was calculated. Data on the presence of cor pulmonale, use of chronic oxygen therapy, number of admissions for COPD in the previous year and smoking history, as well as all demographic and clinical information, were collected upon admission. On discharge, arterial blood gas measurement was repeated. As detailed elsewhere,11 the following information was collected and questionnaires were completed the day before hospital discharge: (1) number and names of drugs and doses per day taken by the patient at home prior to admission; (2) dyspnoea as assessed with the modified Medical Research Council (mMRC) scale; (3) co-morbidities using the Charlson index15; (4) functional dependence at 2 weeks prior to admission with the Katz Activities of Daily Living Scale16; (5) residential status, as living alone, with relatives or institutionalised; (6) marital status, as currently married or unmarried (including those who were divorced, separated, widowed or never married); and (7) the presence of depression, as recorded by the Yesavage scale in its shortened version, which has 15 yes/no questions.17 Finally, treatments at discharge were also recorded. After hospital discharge the patients were monitored by their usual doctors, receiving no intervention or follow-up provided by the investigators. Date and cause of death, whenever available, were collected up to 3 years after discharge. The search was carried out by telephoning the patient or family, and/or checking hospital records and the Mortality Register of Catalonia.18 Subjects who could not be located at follow-up and who were not clearly identified as dead were considered as censored after the time of last survival status assessment. Qualitative variables are expressed in percentages, and quantitative variables are summarised as mean±SD, if normality can be assumed, or as median and IQR (25th–75th percentile) to describe time values. The bivariate and multivariate relationship between survival time and covariates was determined with Cox proportional hazards regression models and graphically displayed with Kaplan–Meier curves. For all survival analysis, mortality was considered the dependent variable, and survival time was defined as the interval between hospital discharge and the date of death, or censored at the date of final follow-up for survivors. CIs were calculated for the HR of significant variables. Results were considered statistically significant at p<0.05. Overall, 379 patients were screened during the two periods, and 329 were included. Six patients (4%) in the first cohort and seven (3.7%) in the second were lost to follow-up (figure 1). Follow-up was available for 316 subjects (296 men and 20 women); of these, 135 participants belong to the 1996–7 cohort and 181 to the 2003–4 cohort. Flowchart (CONSORT) of study participants. *Unable to perform spirometry or do not fulfil minimum spirometric requirements. Mean age of the entire population studied was 72.1 years (SD 9.6). A total of 134 patients (42.4%) were dead 3 years after discharge. Median follow-up was 439 days for deceased patients (IQR 25–75%: 145–775) and 998 days (IQR 25–75%: 921–1088) for surviving patients. Although our study design did not use any matching criteria whatsoever, the two cohorts were comparable in their distribution by age, gender, co-morbidity, functional status and number of hospitalisations or emergency consultation for COPD exacerbation in the previous year (all p>0.05). However the 2003–4 cohort had a lower percentage of non-smoking patients (p=0.02) and higher BMI (p=0.006) (table 1). Mean length of stay was only reduced from 13.5 to 10 days (p<0.001). Regarding respiratory function, again the two cohorts were similar in most variables with non-significant differences, although the second cohort had on average more severe dyspnoea as measured by the mMRC scale (p=0.03) and lower Pao2 at discharge (p=0.009), with a higher FEV1 expressed as percentage of predicted (45.1% vs 41.4%). However, as mentioned above, spirometry in the 2003–4 cohort was performed 1 month after discharge while for the 1996–7 cohort it was performed immediately before discharge (table 2). Only three patients in the 2003–4 cohort died between discharge and the scheduled outpatient follow-up visit 1 month later. They were still included, and previous lung function data were used. Interestingly, no differences were observed in the number or distribution of specific co-morbidities by cohort (table 3). At discharge the patients of the second cohort received more frequent treatment with long-acting β2 agonists, tiotropium, angiotensin II receptor antagonists, statins and antiplatelet drugs (table 4). The observed 3-year survival was 52.6% in the 1996–7 cohort and 61.3% in the 2003–4 cohort; these differences were statistically significant (log rank p=0.017, HR 0.811.52, 95% CI 0.68 to 0.96) (figure 2). Mortality causes by cohort are detailed in table 5. Kaplan–Meier survival curves of participants, by cohort. Log rank p value <0.01. When analysing the association of mortality in patients with COPD and specific co-morbidities between the two cohorts, mortality had decreased in patients with concomitant heart failure (p=0.002) or cancer (p=0.003). These differences by cohort were sustained even after adjustment, in a multivariate model including heart failure or cancer, and both retained independent statistical significance (cohort (p=0.04, HR 1.5, 95% CI 1.07 to 2.1), heart failure (p=0.002; HR 1.76, 95% CI 1.23 to 2.53)) and (cohort (p=0.008, HR 1.6, 95% CI:1.13 to 2.29) and malignancy (p=0.01, HR 2.47, 95% CI 1.43 to 4.25)). 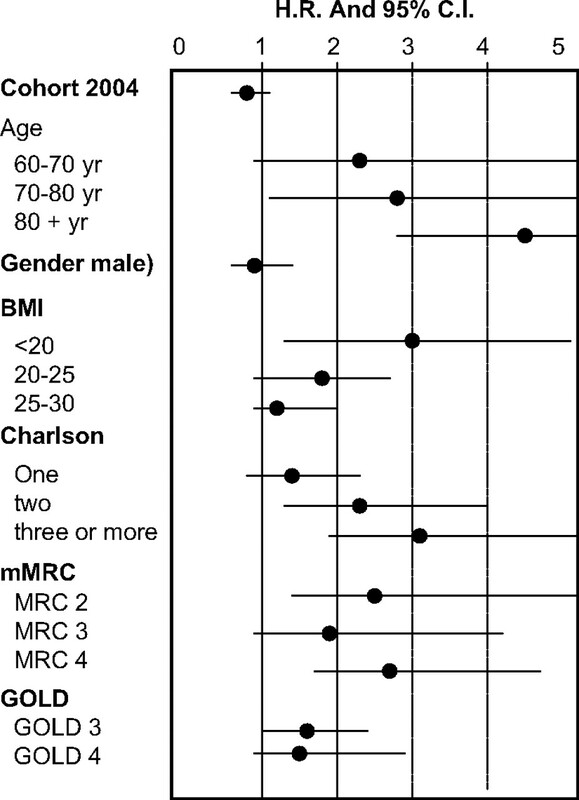 Overall, mortality was lower in the 2003–4 cohort than in the 1996–7 cohort (figure 3), even after adjusting for gender, age, BMI, co-morbidities, lung function and mMRC, (p=0.01, HR 0.66 (95% CI 0.45 to 0.97)) (online supplement 1). Multivariate model (Cox regression) of risk of death by covariates. Reference values are: cohort 1996, age 50–60 years, female, BMI (body mass index) >30 kg/m2, no co-morbidities, dyspnoea MRC 1 (Medical Research Council score) and GOLD (Global Initiative for Chronic Obstructive Lung Disease) 2 severity. Our study concludes that survival in patients after hospital discharge with a COPD exacerbation has significantly improved in recent years, and that this improvement is probably due, at least in part, to a better management of COPD and its associated co-morbidities. Any differences in mortality should be more easily observed in patients discharged after a hospitalisation, given their worsened prognosis. As mentioned above, patients with COPD have benefited in recent years from the availability of new drugs, more powerful and effective than older respiratory drugs. Again, patients from the second cohort were more likely to receive treatment with long-acting β2 agonists and tiotropium, while the percentage of patients treated with inhaled corticoids was similar. We thank Anna Puigdefabregas (Servei d'Informació i Estudis) for her assistance in searching for mortality data of some patients, and Tom Yohannan for his editorial assistance.
. Global burden of COPD: risk factors, prevalence, and future trends. Lancet 2007;370:765–73. Global Initiative for Chronic Obstructive Lung Disease (GOLD). Global strategy for the diagnosis, management and prevention of COPD. 2008. http://www.goldcopd.org.
. A postmortem analysis of major causes of early death in patients hospitalized with COPD exacerbation. Chest 2009;136:376–80.
. Pharmacotherapy for mortality reduction in chronic obstructive pulmonary disease. Proc Am Thorac Soc 2006;3:624–9.
. The prevention of chronic obstructive pulmonary disease exacerbations by salmeterol/fluticasone propionate or tiotropium bromide. Am J Respir Crit Care Med 2008;177:19–26.
. Tiotropium in combination with placebo, salmeterol, or fluticasone-salmeterol for treatment of chronic obstructive pulmonary disease: a randomized trial. 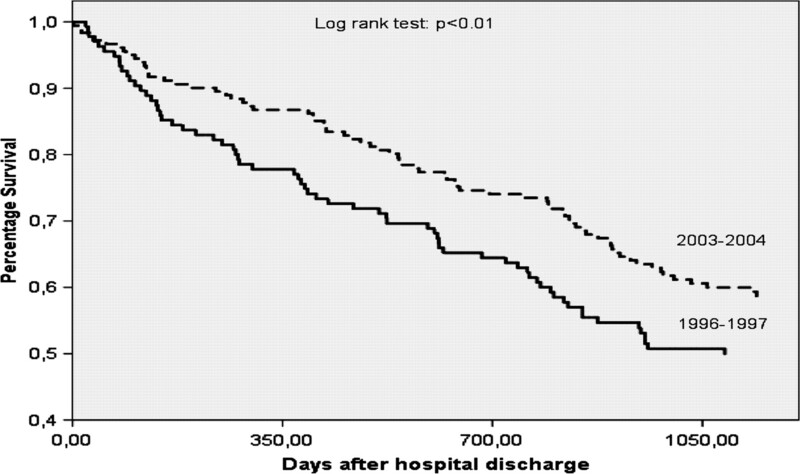 Ann Intern Med 2007;146:545–55.
. Mortality after hospitalization for COPD. Chest 2002;121:1441–8.
. Mortality and mortality-related factors after hospitalization for acute exacerbation of COPD. Chest 2003;124:459–67.
. American Thoracic Society/European Respiratory Society Task Force. Standards for the diagnosis and treatment of patients with COPD: a summary of the ATS/ERS position paper. Eur Respir J 2004;23:932–46.
. Diagnosis and management of chronic obstructive pulmonary disease: joint guidelines of the Spanish Society of Pulmonology and Thoracic Surgery (SEPAR) and the Latin American Thoracic Society (ALAT). Arch Bronconeumol 2008;44:271–81.
. Geriatric depression scale (GDS): recent evidence and development of a shorter version. Clin Gerontol 1986;6:165–73. Mortality Register of Catalonia. Serveis d'Informació i estudis. Direcció general de recursos sanitaris. Departament de salut (elaboración propia).
. Co-morbidity contributes to predict mortality of patients with chronic obstructive pulmonary disease. Eur Respir J 1997;10:2794–800.
. Survival trends in European cancer patients diagnosed from 1988 to 1999. Eur J Cancer 2009;45:1042–66.
. Survival for eight major cancers and all cancers combined for European adults diagnosed in 1995-99: results of the EUROCARE-4 study. Lancet Oncol 2007;8:773–883.
. Survival trends in men and women with heart failure of ischaemic and non-ischaemic origin: data for the period 1987-2003 from the Swedish hospital discharge registry. Eur Heart J 2009;30:671–8.
. Statins in COPD: a systematic review. Chest 2009;136:734–43.
. Reduction of morbidity and mortality by statins, angiotensin-converting enzyme inhibitors, and angiotensin receptor blockers in patients with chronic obstructive pulmonary disease. J Am Coll Cardiol 2006;47:2554–60.
. Treatment of chronic obstructive pulmonary disease and its comorbidities. Proc Am Thorac Soc 2008;5:848–56.
. Randomised, double blind, placebo controlled study of fluticasone propionate in patients with moderate to severe chronic obstructive pulmonary disease: the ISOLDE trial. BMJ 2000;320:1297–303.
. Severe acute exacerbations and mortality in patients with chronic obstructive pulmonary disease. Thorax 2005;60:925–31.
. Health-related quality of life and mortality in male patients with chronic obstructive pulmonary disease. Am J Respir Crit Care Med 2000;166:680–5.
. Mortality in the 4 year trial of tiotropium (UPLIFT) in patients with COPD. Am J Respir Crit Care Med 2009;180:948–55.
. Design options for molecular epidemiology research within cohort studies. Cancer Epidemiol Biomarkers Prev 2005;14:1899–907.
. Survival in patients with class III idiopathic pulmonary arterial hypertension treated with first line oral bosentan compared with an historical cohort of patients started on intravenous epoprostenol. Thorax 2005;60:1025–30.
. Differences in control of cardiovascular disease and diabetes by race, ethnicity, and education: U.S. trends from 1999 to 2006 and effects of medicare coverage. Ann Intern Med 2009;21;150–15.
. Patients hospitalized for COPD have a high prevalence of modifiable risk factors for exacerbation (EFRAM study). Eur Respir J 2000;16:1037–42.
. Update on the management of COPD. Chest 2008;133:14512–62. Funding This study was supported by a research grant from the Fundacio per la Recerca de Mutua de Terrassa (MI03/07). Ethics approval This study was conducted with the approval of the University Hospital Mutua de Terrassa Research and Ethics Committee, and all subjects gave their written informed consent. All co-authors accept responsibility for the conduct of this study and for the analysis and interpretation of the data. All co-authors helped write this manuscript and agree with the decisions made.